You bend the hoop of your life around us. You shape teachings into circle wisdom. You stretch your laughter blue sky taut. You lace sorrow into a handhold for beauty. You beat the heart song of the deer who gave her breath. You dance stories with the language of your limbs. You sing healing the way spring sings rain. You vision bloodstream into spiritstream. You journey with medicine music. You rhythm our broken lives into song. Together we sing our passage. Pungent smell of burnt sage. Haze in the air. Chanted vocalizations. Drummers gather in a circle around a newly fashioned frame drum held horizontally, a pinch of loose tobacco scattered across the drumhead. The drummers beat in unison. The collective sound of a common heart beat. Then it happens: resonance. The drumhead vibrates as it listens to the drumbeats that surround it. The tobacco strands dance on the stretched deerskin. A new drum is birthed. Ready now to sound. Ready now to sing. “Drums have spirit. They are not just objects,” says Jean Becker, Inuit elder and Senior Advisor of Indigenous Initiatives at Wilfrid Laurier University. Her life journey stands as a testament to that conviction. A journey that starts, however, without a drum, without ceremony, without connection to her Indigenous roots. A journey that awakens, transforms, and inspires. A journey she invites others to take into the spiritual realm. Born in remote and sparsely populated Nunatsiavut, Labrador, Jean is of Inuit and English ancestry. She has early memories of her family living on the land eating seal, caribou, fish, partridge, and geese. But while the diet may have been traditional, the ongoing destruction of her cultural heritage meant she rarely experienced expressions of Indigenous beliefs and rituals. There was no drumming in her childhood, no Aboriginal ceremony. Instead the Christian church dominated… or tried too. As a young girl, Jean rejected what she considered to be hypocrisy in the church, the disparity between the teachings and the actions of the adherents. But nothing from her Inuit background remained to fill the void. She left home at 17. An atheist? An agnostic? She was unsure. Certainly without a spiritual centre. Eventually, after many travels, she made her home in Southwestern Ontario where she encountered the Anishinaabe culture and the teachings of elders Art and Eva Solomon. Her welcoming experience was underscored by her recognition that her new teachers actually embodied what they taught. It was a refreshing difference. Art, who was at the forefront of the revival of Indigenous spiritual traditions, introduced her to a Midewiwin sacred ceremony. The impact was profound. Jean began to see herself differently. To see herself as someone who had value. She began to fully understand the fundamental idea: all beings are connected. She found the answer in serving others. She had experienced the powerful effects of ceremonial gatherings, but while pursuing an academic career in Southwestern Ontario, Jean lived in an urban environment that offered few opportunities for connection among the Indigenous community. She set out to change the often solitary walk. 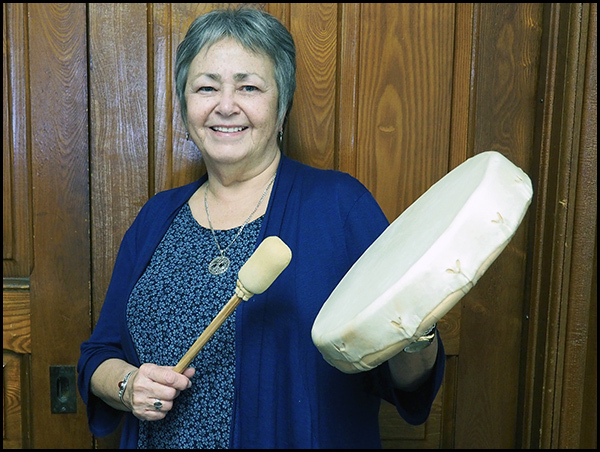 In 2003, living and working in the Kitchener-Waterloo area, Jean organized a way for Indigenous urban women to meet, to socialize, and to find their voices: a drum circle. For thousands of years across diverse cultures, the drum has evoked the heartbeat of mother earth, the rhythmic power of the life force. In our mother’s womb, the first sound we experience is the heartbeat. No wonder drumming elicits a primal response. Drumming in unison summons our sense of shared connection with one another. It energizes both our bodies and minds. And for some, drumming carries them across a threshold into the spiritual realm. Such has become Jean’s passage. Jean’s life-altering journey has opened the door for others to be changed as well. The spiritual animation of the drum circle comes out of careful and respectful preparation. The circle is opened with smudging, the burning of medicinal plants such as sage, sweetgrass, tobacco or cedar, as a ceremonial cleansing. The ancestors and their teachings are invoked as part of the welcoming ritual that includes the prayerful expression of intentions. No one person leads the songs. Rather, various individuals, taking turns, are encouraged to start the singing and are vocally supported by the group. Regardless of the musical talents of individuals, the attitude is the same: no one beats out of time; no one sings out of tune. The women follow a “sweetgrass teaching”. One blade of sweetgrass is not strong, but braided together the sweetgrass is resilient. Thus they support one another both in the drum circle and in their extended lives bound by a sense of community. After several rounds of singing, “The Travelling Song” bids a ritual farewell and acknowledges the connection to all things as represented through the physical movement of the drummers’ bodies turning full circle as they successively orient themselves to “The Four Directions.” The entire experience, with the frame drum at the heart, offers a portal to the sacred. Thus Mino Ode Kwewak N’gamowak thrived. As did Jean, confirmed in her sense of purpose and direction. But illness can beat a jagged rhythm in our lives. Even in the life of a “Song Carrier”. Struggling with serious liver disease in 2007, Jean passed her role on to someone who had also been transformed by the power of the drum: Kelly Laurila. With Indigenous Sami background from Finland, Kelly had heard the call and had previously found her voice within the group. As Kelly and the Good Hearted Women offered support with healing songs and prayers, Jean turned to maintaining the very drumbeat of her heart. Kelly continued the teachings and approach upon which Jean had founded the group. She also extended the group’s reach into the community. More and more the women were asked to perform at various social events. Not established as a performance group, they were stretched and challenged; but public presentations allowed them to carry their Indigenous voices beyond the immediate drum circle into a dynamic relationship with the wider community. Gradually Kelly increased the cadence. She actively sought ways for the group to interact with Settler People using music as a commonality. Events under the banner “Bridging Communities Through Song” hosted by Mino Ode Kwewak N’gamowak in partnership with other organizations, including the Police Choir, became forums for initiating dialogue and fostering understanding. Of course there were awkward moments and tensions, but the language of the drum resonated across cultures. And Jean’s imperiled health? The jagged rhythm almost became no rhythm at all. As her illness progressed, only a transplant could save her. The wait was fraught with apprehension. The odds unfavourable. In the end, the woman who had devoted her life to serving others received the gift of life from a stranger. Another profound experience. Another rebirth. All beings are connected. The rhythm of renewal had prevailed. After her remarkable recovery, Jean returned to her work as an educator at Wilfrid Laurier University. In the broader community she has responded to the call of being an elder: listening, encouraging, guiding and conducting traditional ceremonies. Throughout she has continued to ask, “What does it mean to walk with Love?” The narrative of her life-song and its ongoing legacy of service to others remains the answer. She has become what she admired in her first teachers: an embodiment of values taught. She has become The Woman of the Drum. I first met Jean in 2005 while collaborating as a team member on the development of a high school program for Indigenous youth at St. Paul’s University College, affiliated with the University of Waterloo. The idea was to provide the students with the experience of university lectures, seminars, labs, as well as cultural teachings from elders in circle gatherings as a way to inform, inspire, and encourage further education. Jean, who fulfilled the role of Aboriginal Counsellor at St. Paul’s, understood the diversity of culturally appropriate ways to transmit knowledge and wisdom. As part of the experience, she included a drum-making workshop for the students, faculty, elders and staff. In this setting I cut out and stretched a deerskin across a cedar frame, tightened the rawhide lacings, and made my own drum. Participating in a drum birthing ceremony, with the tobacco strands animate on the head of the drum, I experienced not just the resonance of sound but also a trembling hope. Together we were learning a few small steps in the dance towards greater mutual understanding. Jean’s health issue, however, threatened that hope; and the crisis prompted a group of friends to quilt a healing blanket during the long and intense time of her surgery. I also felt that impulse to create as a way to counteract the shock of her possible loss. “Woman of the Drum” first emerged then as a poem in tribute to Jean and Mino Ode Kwewak N’gamowak. A natural extension, given the thematic intent, was to envision the poem becoming song. Now years later, composer Owen Bloomfield has realized that imagined concept through a choral setting that includes Mino Ode Kwewak N’gamowak’s participation with Indigenous drumming and song. The piece has developed as two sets of voices, initially singing alternately across traditions: the Indigenous and the Euro-Western. Respectful listening to distinctive voices, an essential element of the composition, leads ultimately to greater understanding and engagement as the two groups eventually sing together in the spirit of common music making — Bridging Communities Through Poetry and Song. Thank you to Kelly Laurila and Melissa Hammell for their personal narratives as members of Mino Ode Kwewak N’gamowak. Appreciation also to Debbie Lou Ludolph, director of Inshallah, a Martin Luther University College singing community of over 130 voices musically celebrating diversity.